My father and I were estranged for several years. During that period, around 1999, my mother brought my grandparents from Georgia to Texas to live with her, and I moved back home to help her with them. My uncle, Mom’s younger brother, would come visit a couple of times a year and spent one to two weeks really getting things done around the house. He helped with repairs, or installations, spent time with my grandparents, freeing up my mom from her round the clock duties, and was just a general blessing. The last physical gift my father gave me before he left home, and before our estrangement, was a little figurine. I got it for Christmas in 1992. That was the last gift he actually went out and bought for me, though he has always put a check in my birthday and Christmas cards. It meant something to me, though, because it was a little touchstone once he was gone. It was a goofy little thing, and I wasn’t sure why he picked it for me, but I did love it. On one of my uncle’s trips, I asked him for and received some very good advice. It was advice I wished I could have gotten from my father, but that just wasn’t to be. I didn’t know how to thank him, and since I am a crier (and an ugly crier at that), I was afraid to say words and then melt down into howls. So, I wrote him a thank you note, and waited until he was walking out the door for his flight, and I handed him the note and I gave him the figurine. I think. I may have just stuffed it in his bag. I don’t remember that. I know he told me that he didn’t understand, but that it was obviously a treasure to me, so he would treat it that way, but I don’t remember if that was in person or on the phone. It’s kind of funny that I blocked that–I think I was traumatized by my own levels of emotion. I just couldn’t think of any other way to express my appreciation, even though it made no sense. It was just a couple of years ago that I told my aunt what the thing actually was to me. I’m not really good at face-to-face serious emotion. At least not when I am feeling it deeply. That’s why I write. I can write anything and that’s okay. You can’t see the ugly cry when I just write it down–and I cry because I love people, and I cry because I’m happy, and I cry because I am fortunate, and I cry because Mariah Carey’s boyfriend got gunned down in Glitter before he could see that she had truly made it. I just cry. 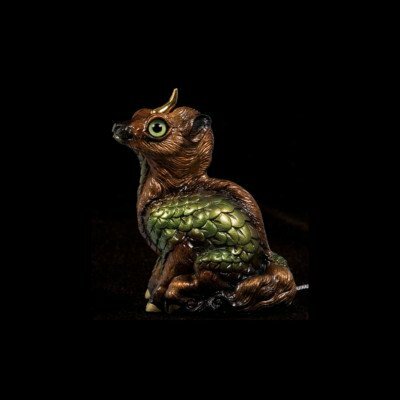 I’ve thought about it from time to time (most of the time feeling embarrassed at how silly it must have seemed to have this grown woman passing off a uni-dragon with glass eyes), and I’ve checked the internet to see how the twee little guy is doing in the rest of the world. He’s pretty popular. That makes me happy. It makes me very happy to know that the little guy is with my uncle, a man who truly deserves to be acknowledged and appreciated, and even if no one else ever really gets it, I know what it means. Some things going on peripheral to my world have me thinking about what we give freely, and what we expect in return. When we give, it has to be without strings, or it isn’t a gift. If you go down to the river with some cheese and you throw it into the water for the fish, that’s a gift. Once it hits the water, it’s gone. You won’t see it anymore, and you won’t ever really know what happened to it. You don’t need to know. It was a gift. You’re happy and the fish is happy. If you go down to the river with some cheese attached to a hook on a line and pole, and you throw that into the water for the fish, that’s not a gift. You’re happy, but some catfish is going to end up flopping on the end of your line in great misunderstanding. Same cheese. Same lake. Same fish. Very different outcome. One does something for you and the fish. One does something only for you. What are our motivations? What are our intentions? Are we giving, or are we fishing?